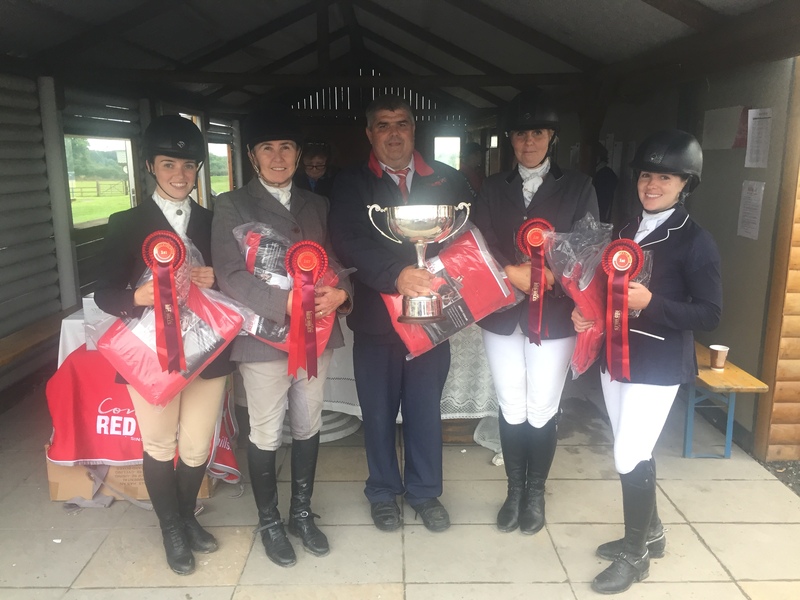 Thomastown & District Riding Club had an impressive winning margin over their opposition when they won the Connolly’s Red Mills Team Championship at the AIRC National Dressage Championships last Sunday. With the best three scores counting from the two rounds, Caroline Carey was undoubtedly the star performer as the Gowran resident produced the highest scoring test of the competition of 78.95% on Stonehavens Olive in her morning test. Her afternoon test was equally impressive as she scored 75.50%. Jade Douglas wasn’t far off the mark either as Carrigbeg Coco, a seven year old brown mare, registered a score of 77.83% in the morning and this was followed with the teams highest score of the afternoon of 75.95%. A record equalling number of teams sought qualification for this year’s final as 83 teams took part in nine regional qualifiers, the same number as last year which was an increase of over 40% since the new qualification format was introduced in 2013. The Arderin team of Denise Troy (Lowertown Miss Elsie), Caroline Purcell (Delilah KH), John Purcell (Glenbars French Connection) and Tina Goodenough (Merton Hall Lass )were next best in second place on a score of 422.76%. The Offaly club had almost 3% to spare over the Mosstown team of Emer O’Donnell (Mosstown Todd), Sarah Phelan (Addrigoole Lightening Jack), Eilis McLoughlin (First Man Lara) and Lesley Fitzgerald (Amhac Ni Ri) who finished on 419.87%. The three member team from the Coole Lane club in Carlow narrowly missed on a podium finish on 418.89% in fourth place while last year’s winners, Ashbrook, had to settle for fifth place on 416.21%. Kerry Riding Club completed the line up on 413.92%. Laura Fitzsimons recorded the highest score of the day at the Connolly’s Red Mills National Dressage Championships to win the Advanced Primary title last Sunday. The Navan resident riding a 16-year-old grey Connemara, Kilronan Duff, produced an impressive score of 82.83% in her morning performance and followed this up with 74.29% to claim the title from a field of 37 starters. The Ashbrook riders total of 157.11% gave her a less than 2% to spare over Mosstown’s Sarah Phelan who finished in second place on 155.57% on Addrigoole Lightening Jack. At the championships, competitors ride two tests in front of different judges, with their scores accumulated, to determine the fate of the national titles. Catherine O’Sullivan won the Intermediate championship after an stunning performance from Paintwork Lad from a field of 30 starters. The Corrib rider was third after the morning test on 66.67% but added 80.63% in her afternoon test to move up the leaderboard into the top spot. Her tally of 147.29% gave her a significant advantage over Emma Walsh (Inis Blossom) from Kilrainy on 140.60% while Melanie King, who led after the morning session, had to settle for third place on Drumin Gregory on 139.67%. 27 riders contested the Advanced Intermediate championship where Mary Bradley (Mister Boombastic) led after the morning session on 70.65%. The Kerry member extended her lead in the afternoon with another impressive test to finish on a winning score of 141.48%. Earl’s Well member Aine O’Loughlin took the blue ribbon on Heatherville Moss on 135.63%. Michael Moore claimed another national dressage title for the second year in a row, this time in the Advanced Open division. The Donaghmede resident led from start to finish on Smart Decision who registered a score of 140.19%. Twinfort’s Tabitha Millar Hagerty (Ballylynch HP) was next best on 136.45%. In the Open championship, Owen Smyth claimed a narrow win on Dark Site after the Crecora resident finished on a tally of 143.60%. The Twinfort member had just over one percent to spare over Thomasina O’Reilly on Rosscon Camille who finished on 142.39% for Mosstown. In the Primary championship, Caroline Carey won the honours on Stonehavens Olive. The Thomastown & District rider moved up from joint fourth to pole position after an impressive afternoon test to finish on 141.72%. Mary Leahy (Gooseberry Hill Billy) finished closest on 139.14% to take the blue ribbon for Kerry Riding Club. Elsewhere in the non-championship classes, Mosstown’s Emer O’Donnell claimed the spoils in the Advanced Primary division on Mosstown Tod while Patricia McDermott topped the Intermediate class on Saddlers Mystery IRE for Clonlara. Warrington’s Billie Mae Geoghegan won the Advanced Intermediate division on Brokenhearted Kate IRE while Aisling Deverall won the newly introduced Young Horse class on Annaharvey Dunowen.